Sometimes words like “legend,” “pioneer” or “groundbreaker” can get thrown around a little too lightly and other times they are the perfect words to use. 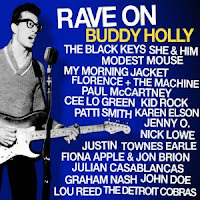 Buddy Holly was absolutely all of the above and his enormous impact on music is clearly evidenced in the newest tribute album in his honor, Rave On Buddy Holly. Having some of his best-known songs interpreted through a variety of voices and genres really highlights the power and originality of his songwriting. While the 19 tracks are lovingly rendered through each artist’s own filter, the actual songs being covered remain the star of the show. One of the things that impressed me the most about Rave On Buddy Holly is the raw passion and energy that ripples through the album. These are not phoned-in, straight shot run-throughs of some sock hop classics. They are brassy, electrified love letters to a man that helped shape rock music as we know it. Buddy Holly’s music may be incorrectly viewed as somewhat tame by today’s standards. But make no mistake about it, underneath the iconic black-rimmed glasses and the hiccupping vocal delivery is some of the most primal, definitive rock music that’s ever been made. Rave On Buddy Holly hosts an impressive mix of veterans, upstarts and in-betweens. I love that artists like Paul McCartney, John Doe, Lou Reed, Patti Smith, Graham Nash and Nick Lowe, who are all worthy of tribute albums on their own, turn in raucous and touching renditions of the songs they grew up on. The “Helter Skelter” vibe of McCartney’s “It’s So Easy” and the laid-back drawl of Doe’s “Peggy Sue Got Married” are equally hair-raising and heartwarming. There's some nice garage rock fuzziness on The Detroit Cobras' "Heartbeat" and Julian Casablancas' "Rave On" and some bouncy, country-tinged rockabilly on Justin Townes Earle's "Maybe Baby" and She and Him's "Oh Boy." Showing that covering Buddy Holly isn't limited to the guys, Fiona Apple ("Everyday"), Karen Elson ("Crying, Waiting, Hoping") and Florence + The Machine ("Not Fade Away") turn in some truly excellent covers as well. Cee Lo Green even shows up to honor Buddy Holly's legacy as only he can with a super quick, super fun version of "(You're So Square) Baby, I Don't Care." It's really astounding what he accomplishes in just a minute and a half. In fact, the short track lengths on most of the songs is the only small drawback to this otherwise phenomenal album. Alot of these songs definitely leave you wanting more. However, that's not a bad thing and sadly that feeling is in line with Buddy Holly's life as well. Passing away at 22 in a plane crash that also took the lives of Richie Valens and The Big Bopper, Buddy Holly captured everyone's attention, changed the game and was gone before anyone knew just exactly what he had done. Rave On Buddy Holly does a great job of reminding us all how special his music was and still is.